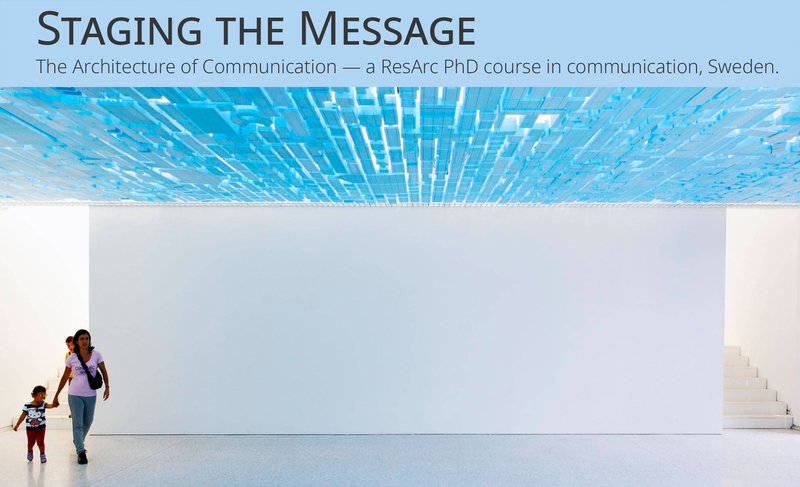 This ResArc Communication course intends (www.resarc.se) to offer participants in-depth theoretical and practical tools for communication and media production. The communication course is part of a series of four PhD courses developed in collaboration with the four-architecture schools in Sweden (www.resarc.se). Besides Communication the Swedish Research School in Architecture offers three other courses for PHD researchers: Tendencies, Approaches, and Philosophies. With the course “Staging the Message. The Architecture of Communication” we will analyze, discuss, learn, test and develop – with the support of excellent scholars and practitioners from the field of the image, writing, editing, and curating architecture publications and exhibitions – how the form(at) of your dissertation/research – right from the start, and during the development of your research as a whole – can enable you to critically reflect and develop its content through the interplay between content and form; while the chosen and developed form also will enable you to broadcast, (edit, communicate and mediate) your ideas (content) to an audience within our information age at large. With Modernism architects started to see how important the intimate relation between architecture and media is, the one of publishing and exhibiting. And – as Beatriz Colomina has pointed out – “that architecture only becomes modern in its engagement with the mass media, and that by doing so it radically displaces the traditional sense of place and subjectivity” So it is of no coincidence that Le Corbusier – as revealed by Christine Boyer –listed his profession as “homme de lettre” (man of letters) instead of having the name architect in his passport. Le Corbusier was meticulous how through page layout, the form of type, the genre of writing, photographs, diagrams, sketch books, exhibitions and even promotional material, his ideas could be mediated, but also how these formats could help him to advance his ideas about architecture, urbanism and society in the new machine age. For contemporary architects alike, such as Denise Scott Brown and for instance Rem Koolhaas, research, writing, making publications, editing journals and designing exhibitions has been inseparable from their practice. As Denise Scott Brown wrote in her introduction of the recent reprint of Learning from Las Vegas facsimile edition: “Photography was our primary tool. Propounding ideas with a focus as unpalatable as everyday architecture is not easy. We knew it would require showing ‘what is’ before proposing ‘what should be’ and would call for pictures as well as words to explain to ourselves what we were learning, but we soon found that the combination could help others understand our ideas too. And we discovered what every architectural journal knows, that the captions under pictures are the only texts most architects will read. So we chose a medium with generous captions – the photo essay.” Or in other words – as Rem Koolhaas put it: “Part of the work is to describe architecture’s evolving present, … to prepare ourselves to deal with issues, …to know what kind of architecture you want to do. I try out different genres, different tones, clinical – Generic City, or hysterical – Junk Space”. Through experimental forms of architecture communication, mediating space; by means of books, journals, genres, models, exhibitions and alike) the architect discovers and mediates what the evolving present is about, and where moments of transformations can be enacted. Another essential element of the communication course is how your mediated research can establish a pro-active relation with its audience in today’s society. In reaction to the virtual realism of the spectacle dominating mainstream media – which prevents a substantive use of word and image, this course deals with the textual, visual (photography, video, internet) and spatial practices that furthermore refine, complex and argumentative forms of communication and foreground the constructed nature of their messages in order to solicit the active interpretation of the viewer/reader. To paraphrase architect Stefano Boeri we are in need of interactive antennas that counter a geopolitics that destroys any chance of communicative action. It is for this reason that the course focuses on the practices of a narrative language use in text, image, spatial and electronic media with emphasis on the potentialities and richness of the ‘reflexive’ or ‘dialogic approach’. It tries to recuperate the specificity of its progressive and participatory practice – due to its role in the socio-cultural context producing meaning and symbolic values – by concentrating on the editing and making process. Which is to say that the course will introduce a way of directing that structures the collection of information and its editing in such a way that the staging, the ‘mise-en-page’ of the message gets the complementary sensitivity its content deserves. With Els Kuijpers, Meike Schalk, Karin Reisinger and Roemer van Toorn. Working, as cultural producers do, in the tension between thinking and making, between theory and practice, between presentation and representation, presupposes linguistic awareness and requires a deliberate staging of the message. Focusing on narrative strategies and methods, media and language uses of critical sense making from different cultural fields – literature, fine art, architecture, communication design, and film. Els Kuijpers will sketch a history of mentalities in which attitude gets form under changing socio-economic conditions. Roemer van Toorn will outline how thought in architecture (theory) over time developed and through what kind of formats it emerged. PhD research is a rather recent development in architecture, what to think of research as dissertation, examples how it can be done, and what kind of formats of thinking influences the practice (what are canonical examples, what are its channels of broadcasting, and where do we stand as academia (examples). 11.30 – 12.00 Welcome Meike Schalk, introduction lecture to the course Roemer vanToorn, and Els Kuijpers. 13.00 – 14.45 Seminar lecture “Staging the Message, The Architecture of Communication”, Roemer van Toorn and roundtable discussion with Els Kuijpers, Karin Reisinger, and Roemer van Toorn. Els Kuijpers is a publicist, educator and curator design and visual culture, and teaches design history and theory the Royal Academy of Art, The Hague, NL, and exhibition design theory at Artez, Institute of the Arts, Zwolle. Publications i.e. : Ootje Oxenaar, designer + commissioner, 010 Publishers, Rotterdam. Currently she is finalizing her PhD research entitled: “The politics of design: the liberating potential of communication design in post/modern times – Towards a critical methodology in communication design”. (https://www.linkedin.com/in/els-kuijpers-a6b3376). Karin Reisinger is an architect with a PhD in Visual Culture from Vienna UT. She has been teaching the courses Art in Changing Environments at Vienna UT (Institute of Art and Design) and Feminist Ecologies at the Academy of Fine Arts Vienna (Institute of Art and Architecture). Currently, Karin is a research fellow at ArkDes Stockholm, following a postdoctoral fellowship in Critical Studies in Architecture at KTH Stockholm (2016-2017) which allowed her to engage with the mining areas of Northern Sweden. Book chapters include “Insomnia: Viewing Ecologies of Spatial Becoming-With” in After Effects (forthcoming 2019, Actar), “Abandoned Architectures: Some Dirty Narratives” in Architecture and Feminisms (2017, Routledge), and “Connective Oscillations: Architectures Between the Devil and the Deep Blue Sea” in More (forthcoming 2019, Didapress). Karin co-organised the AHRA conference Architecture and Feminisms: Ecologies, Economies, Technologies (2016, KTH Stockholm) and edited, together with Meike Schalk, the volumes Architecture and Culture issue 5(3) “Styles of Queer Feminist Practices and Objects in Architecture,” and the field issue 7(1) “Becoming a Feminist Architect,” both 2017. The module will include besides editorial meetings where the work of the PhD students will be further developed and discussed a public lecture by one of the guest professors, a public forum debate with different researchers, curators on architecture exhibitions and a tour through the architecture museum ArkDes. With Meike Schalk, Roemer van Toorn, Ana Betancour and others guest professors to be announced). Students will present their developed PHD communication work (after having followed the two earlier modules as explained above) to and in dialogue with different experts in the field of communication (writing and exhibiting) and doing architecture research. Program and participants will be announced at a later stage. More information will be announced for this March 2019 module as soon as possible. The course consists of three seminar modules (each three days long: Wednesday, Thursday and Friday) and takes place at the KTH School of Architecture, Royal Institute of Technology, Stockholm (Module 1 + 2) and in collaboration with the UMA School of Architecture, Umeå University at the Royal College of Art, Stockholm (Module 3). The course is headed by Meike Schalk and Roemer van Toorn, with the assistance of PhD participant Vasily Sitnikov (KTH) and developed in close collaboration with experts and invited guests for each module. Every seminar – module – will be devoted to one specific framework (as explained above) and will include introductory and specialized internal and public lectures besides working sessions – editorial meetings – where we discuss the readings, your submitted blog, analysis of communication projects and discuss possible form(at)s of your research content. Before each seminar begins participants will be expected to upload blog posts to the ResArc-communication course weblog. For each seminar a reading list, and projects to analyze will be made available to all participants through the website. Besides comparative critical analysis of publications and exhibitions, critical readings and interpretive blogs, we ask each participant to “form(at)” his/her own research according to the knowledge and experiences s/he gained through the course. Besides preparing work in advance for each seminar, work will be further developed, produced, discussed and reviewed in collaboration with the guest professors and coordinators invited. Participants will be required to respond to a series of minor exercises across the three modules by using a combination of image (diagram, collage, models and so forth) and text. These exercises will be discussed in class and uploaded to the communication course Blog. Participants will be invited to actively contribute to the editorial meetings which are held besides the different introductions and (public) lectures during each module. As initiated in the philosophy course participants will be asked to create a “Conceptual Guidebook”. You are encouraged to compile the activities and exercises undertaken across the three modules as a “Guidebook” that highlights your specific research questions. Add to your Conceptual Guidebook a title, a contents page, an introduction, and responses to discussions, readings and exercises across the three modules. This will be compiled as a PDF document and emailed to Meike Schalk (meike.schalk@arch.kth.se), Roemer van Toorn (roemer.vantoorn@arch.umu.se). Participants can achieve either 5 or 7.5 credit points for this course. Active participation in the seminar is required, including the submission of 2 of 3 blogs on the website and reworking of own research (it can be an article, the draft dissertation, video, photography, or other media that are an essential part of the research) during the three modules. At the final module – for an extra 2.5 credits – each individual PhD students can present her/his dissertation communication format. November the 21st, 22nd and 23rd, 2018 at the KTH Stockholm. February 20st, 21st, 22nd, 2019 at KTH Stockholm. Communication Course Module Two – Exhibiting Architecture. The Architecture Exhibition Complex. Communication Course Module Three – Presentation Conference. Conclusion-Examination. The content, time schedule and pre-course module assignments will be presented by email, and published on the communication weblog, to everybody enrolled for the course. Course responsible and contact Meike Schalk (meike.schalk@arch.kth.se), and Roemer van Toorn (roemer.vantoorn@arch.umu.se) with assistance of PhD candidate Vasily Sitnikov (vasily.sitnikov@arch.kth.se). Beatriz Colomina, “Privacy and Publicity: Modern Architecture as Mass Media”, the MIT Press, 1996. Christine Boyer,” Le Corbusier Homme de Lettres, Princeton Architectural Press, 2010. Boyer counted that Le Corbusier wrote more than 79 books, catalogues and pamplets, 511 articles, edited 55 issues of journals, designed exhibitions, and worked closely with photographers, and filmmakers. Denise Scott Brown, “The Tyranny of the Template: The graphic Design of the First Edition of Learning from Las Vegas”, in “Learning from Las Vegas”, facsimile Edition, MIT publishers, 2017. Beatriz Colomina in conversation with Rem Koolhaas: “The Architecture of Publication”, Rotterdam, February 2007, AMOMA Rem Koolhaas, Theory & Practice II, El Croquis, nr. 134/135, 2007. Stefano Boeri, Architecture and Geopolitics, Domus 901, 2007.